We all see rich benefits from participating in SSASS as a volunteer instructor. Instructors participate in regular adaptive training workshops as well as coaching sessions to improve their own conventional skiing or boarding technique. Through BCAS membership instructors can access a wide range of discounts at many resorts. 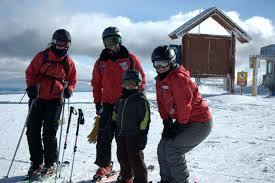 Silver Star Mountain resort supports SSASS by reimbursing early bird seasons passes for instructors. Those who complete 20 or more lessons receive the full value of the pass, while those completing 10 lessons receive half the value of an early bird seasons pass. The Snowsports School at Silver Star also offers discounts on CSIA Level 1 courses to active SSASS instructors (policy varies from year to year). Participation in SSASS opens a door to a team with a common purpose with many warm and friendly people. Many of us have made new friends through volunteering at SSASS. In addition we all have our individual motivations and interests that lead us to SSASS in the first place. Contact us info@ssass.bc.ca if you want to explore how you could fit in. We’re always looking for new instructors! Our busy season is January through March.